If I can bike, so can you! I’m writing this post as I am trying to catch my breath after riding/walking my bike up a VERY STEEP hill. The hill is only .5 miles but it feels like 50 miles to me when I’m pushing my bike up that long, hot, steep, windy road to my house. The point is I did it! It was not easy and to be honest it was not fun. One night a few Twitter friends and I were having a conversation about the oil crisis that is going on. One friend said she was going to commit to riding her bike at least once a week to work and she challenged me to ride my bike to all the places I check in on Foursquare. Of course, my first reaction was, “you have not seen my hill!”. For the last 15 years I’ve lived up this VERY STEEP hill, I’ve always dreamed of biking but never thought it was possible for me (the wimp) to get up and down that hill. Besides the strength (lung and leg) needed to get up that hill I have a serious un-rational fear of riding downhill. But this oil mess really got to me. I felt helpless. I didn’t feel comfortable just blaming BP and boycotting or blaming the politicians. In my heart I know it’s not any one person or one company’s fault; it is all of our (oil consuming) faults. So here I am knowing I’m partially responsible and using my hill as the excuse I had to continue driving everywhere. Then… I had a light bulb moment. I realized I go hiking every single day up and down steep hills on the trails behind where I live so why on earth could I not hike up and down that one short (steep) hill to my house. 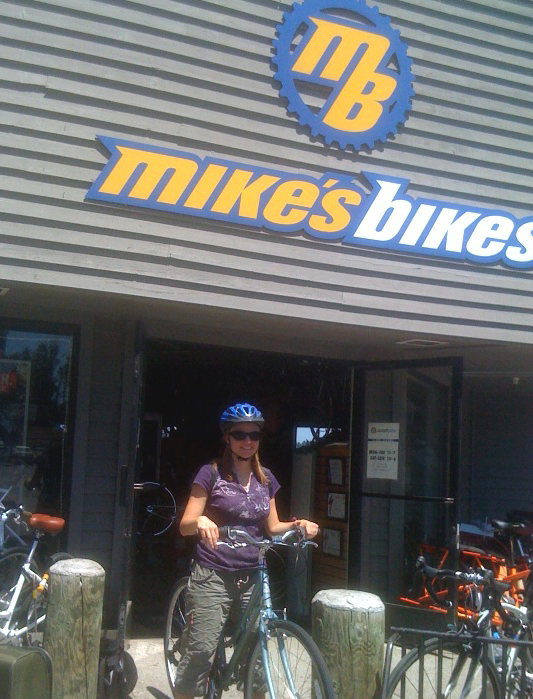 It just so happened Mike’s Bikes in Sausalito was having a big sale that weekend! So… I went and got my bike. I got great service from Brian who asked me questions about what kind of biking I was going to do and showed me the different bikes he thought would work best for me. I found my dream bike! The color and everything was exactly what I had been visualizing. 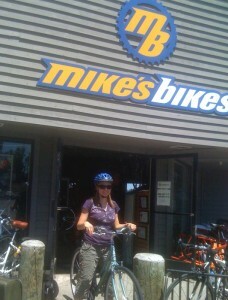 I picked out my bike, Brian took it to the back and had the mechanics check it out and then it was ready to go! 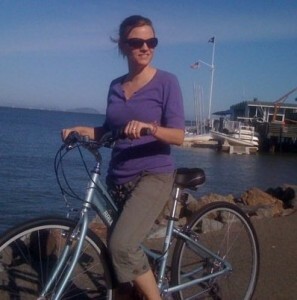 I went for my first ride on my new bike right out of the store along the Sausalito bike path all the way to the water. It was such a beautiful day! The first week I started out driving my bike up and down the hill but I soon got tired of putting the bike in and taking the bike out of the car so I decided to overcome my hill fear and just go for it! I figured I’m a great hiker I could walk this hill no problem if biking was too difficult. Friday night I rolled/walked my bike down the (very steep) hill and headed to Mill Valley Beerworks to meet my Twitter-turned-real friends for a beer. Mill Valley Beerworks was happening! We squished 11 people around a 6 person table. (Blog post coming soon). Fortunately on Friday night I got a ride back up the hill but today… I was meeting someone for coffee in downtown Mill Valley and just couldn’t justify driving my car there and back so I went for it. Today was my first day coming up the hill on my new bike. It was not easy but I did it! If I can ride a bike, so can you! I’m not fully giving up my car. I will still drive places but I do plan to bike more and drive less. I challenge you to ride your bike more and drive less. I would love to hear about your biking stories. Please leave a comment below. A great way to protest oil! Go you! Hurray for driving less, breathing harder, and enjoying your surroundings. Your lungs and legs WILL get stronger, and the hill will get easier. Thanks a lot for sharing this with all of us you really understand what you’re talking approximately! Bookmarked. Kindly also visit my web site =). We can have a hyperlink change contract between us!